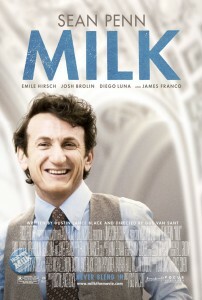 On the heels of Prop 8, comes Gus Van Sant’s “Milk” and without mincing words, it’s a tour de force. The truth is, as big as this movie’s subject matter is – the assassination of San Francisco’s first out gay politician, Harvey Milk (Sean Penn) – and as much opportunity as there is to pound in its message, the reason the movie works so well is because it is thoughtful in its telling and its performances are so subdued. A movie along these lines is, frankly, ripe for melodrama but Van Zant goes deeper and puts character before agenda. Early in the movie, Milk literally stands on a soapbox but never for a moment do we get any of the Oliver Stone bombast. Milk intentionally uses his personable nature and humor to reach or rather, create his constituency. It is no doubt something of a defense mechanism. Harvey Milk led a closeted life until he was about 40 years old, which happens to be just when the movie starts. A moment later we see that Milk has been killed and the movie is told in flashbacks as Harvey sits at his kitchen table and commits his story into a tape recorder. His calm narration gives the movie its stabilizing tone.